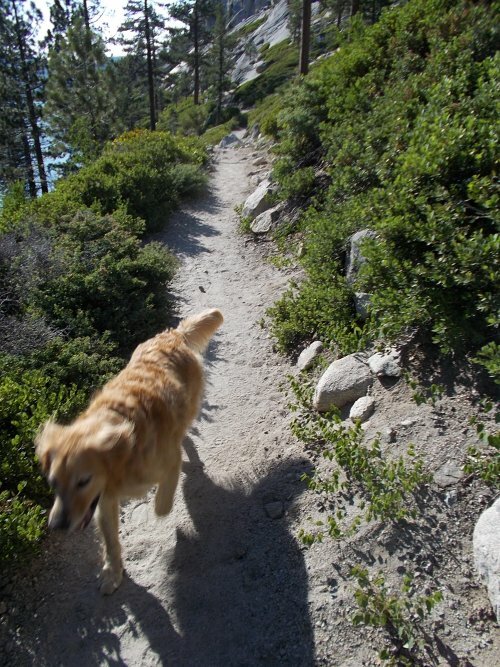 Another Long Walk: Back on the PCT! When I woke in the morning, Amanda was already gone. Off to the airport in Reno in the dead of night. I ate breakfast, brushed my teeth and packed up camp like usual. I had the use of a picnic table to sit at, which was a nice convenience that I usually didn't have available on my backcountry adventures. I also disposed of what little trash I had in the bear-proof trash cans before I hefted on my pack and started walking. It would be my earliest start yet, on the trail and walking at 6:30 in the morning. I had to hike a half-mile back to the Tahoe Rim Trail, and although it was all uphill, it didn't bother me as much as when I had to hike down into the campground. Amanda wasn't around to drive me to the trailhead, after all. It was also morning, cool, and my feet were freshly rested. But I needed a very early start because I looked at my Desolation Wilderness permit late the night before and realized, holy cow!--the permit was only good for tonight. For some reason, I thought I had asked Amanda to get the permit for the next night. Nope, it was for tonight. Which, by my calculations, meant I needed to hike over 20 miles (20 miles!!!) 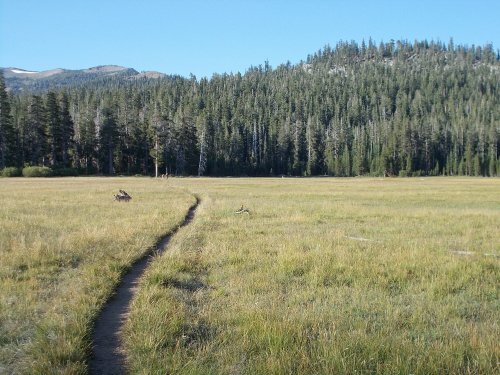 to reach the Desolation Wilderness. Technically, if I was short, that wasn't a big deal. 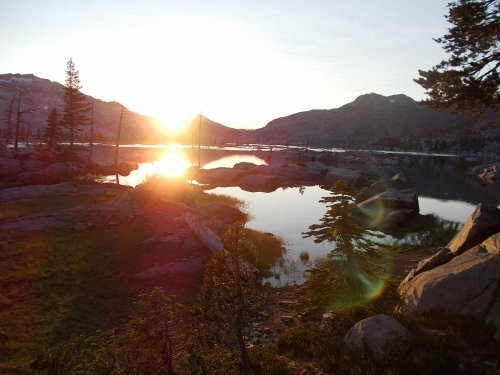 It was okay for me to camp pretty much anywhere outside of the Desolation Wilderness without a permit. 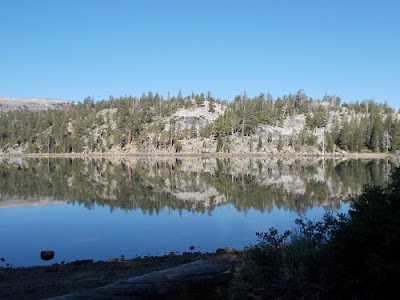 The problem with that, however, was that the next day, I'd have a tough time making it completely through the Desolation Wilderness without camping. From end to end, it's about 20 miles. I could hike completely through the Desolation Wilderness and legally set up camp on the other side, but that would be over 20 miles. The next water source was even further away, though--I might have to do over 25 miles to keep my campsites legal. Within an hour, bugs started coming out thick. The non-biting kind didn't bother me so much, but the mosquitoes.... I don't like mosquitoes. Nobody likes mosquitoes. And they were far worse than anything else I had experienced thus far on the TRT. I've suffered much worse on other trails and hikes, but this was definitely the worst I had seen it so far on the TRT. I was pleasantly surprised at the lack of bugs up until this point. Now that I was getting to the "wet" side of the Tahoe Rim Trail, though, it looked like I'd have to consider the bug issue a lot more closely while setting up camp. 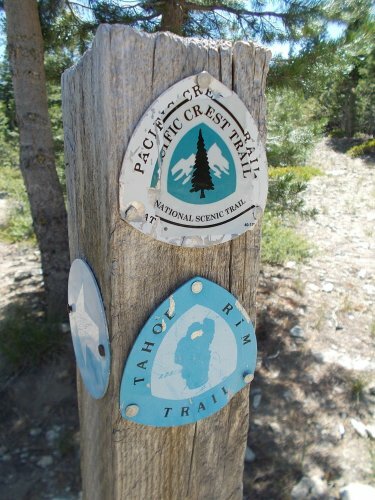 About five miles into the day's hiking, the trail intersected with the Pacific Crest Trail. I looked south on the trail, knowing quite well I could follow it about a thousand miles to the Mexican border. I've hiked that path before. And I looked north on it too, knowing it traveled all the way to the Canadian border. I've done that side of it too. Mexico to Canada. It's still a staggering concept in my head, even though I've actually done it. But that was another trip. For now, I'd only travel northward on the PCT for about 50 miles where it overlapped with the TRT. I'd probably even see some thru-hikers along the way as well. This was the same time of year when I passed through on my PCT hike, so there should definitely be thru-hikers on the PCT somewhere nearby. The trail continued onward. It's southern direction now a definite northern direction around the west side of Lake Tahoe. The trail descends some steep slopes towards Echo Summit, which I distinctly remembered having quite a few large patches of snow during my PCT thru-hike. There was no snow now. Not a spec. I could even remember postholing through a patch of snow which banged a shin, and I wondered where exactly that happened. I heard it was a low snow year this year, but I still couldn't get over the sense that the trail felt wrong without patches of snow here. It was the same time of year as before. Just a lot less snow. 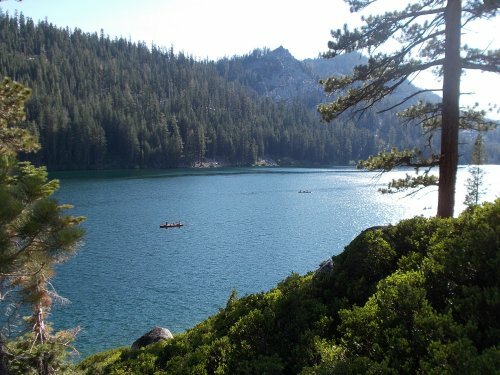 I still passed no hikers on the trail, not until I reached Echo Lake and the Echo Lake Chalet. I stopped at the store where I purchased ice cream and a Coke and mailed a bunch of postcards. And this was also where I met my first two PCT thru-hikers: Coyote and Roadkill. They looked like thru-hikers. Cleaned-up thru-hikers, as if they just got back on the trail from a visit to town, but they still had that thru-hiker swagger. Back on the Pacific Crest Trail! 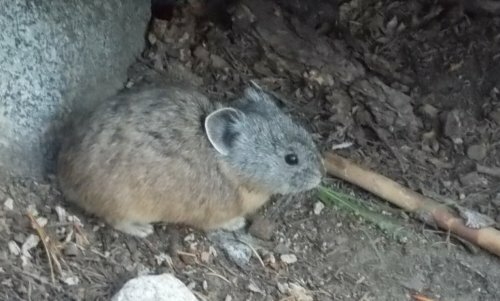 I didn't talk with them long, but did learn that they had indeed come out from two days in South Lake Tahoe. They also told me that there was practically no snow anywhere on the PCT for them. "It snows on Fuller Ridge?" they replied. Oh, yes, it snows there..... They said that even the highest passes of the PCT, there was never anything more than just patches of snow on the trail. I told them about postholing for ten miles over Muir Pass during my thru-hike. "Yeah, we didn't have any of that." And none of the river crossings were very bad, they told me. Apparently, a low snow year also means low water levels. "So you didn't cross a single river that was waist-deep, fast-moving water?" Curse them. Curse them both! "You might have to come back and re-do the PCT then. You're missing out!" I continued on the TRT, working my way towards the Desolation Wilderness now just a couple of miles more away. Coyote and Roadkill stayed behind, eating ice cream cones. This section of trail had enormous quantities of people on it. Day hikers, weekend backpackers and thru-hikers. Most of them I passed with nothing more than a wave or a "hi." A few asked me about my "nose thing," wanting one for themselves. 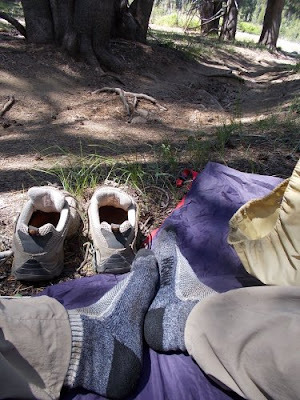 Then a solo hiker caught up with me who, by the looks of him, I pegged as a PCT thru-hiker. He was. "Let me guess.... you broke your toe while hiking, but kept on hiking anyhow?" Which was exactly what happened, except that was when he thru-hiked the Appalachian Trail earlier. Now that's dedication for you. He also told me that next year, he intended to set a new PCT speed record. The last I heard, the current speed record for thru-hiking the PCT is about 66 days, set by Scott Williamson, which means averaging more than 40 miles per day! Scott was the first person to yo-yo the PCT (hiking from Mexico to Canada then back to Mexico in a single season), and seems to regularly break his own speed records on the PCT. He's a hiking legend in the thru-hiker community. "You plan to beat Scott Williamson?" I asked. "There are actually three of us that are going to try to beat him next year." I don't know Broken Toe well enough to judge his chances of success, but it's an ambitious goal. It'll certainly be interesting to find out if he can succeed or not. He also told me that he heard that Scott is on the PCT this year, hiking southbound, in an attempt to beat his current record. I finally reached the boundaries of the Desolation Wilderness--an incredibly beautiful place with an abundance of lakes and granite. Glaciers carved out this granite wonderland eons ago. And I had finally reached my goal for the day. I was ready to stop and set up camp. I could legally camp anywhere in the Desolation Wilderness, as long as I stayed at least 100 feet away from water. Which was fine by me--I wanted to stay away from water. The mosquitoes like water, and I don't like mosquitoes. 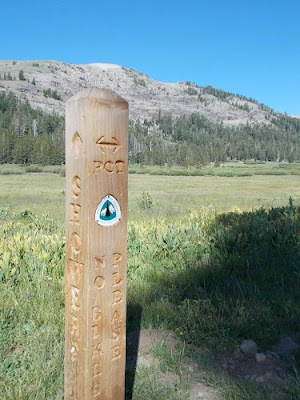 For 50 miles, the PCT and TRT overlap. Except, I had about half a liter of water in my pack. I definitely needed more water before I could set up camp. So I kept hiking. Just until I got to the next water source. 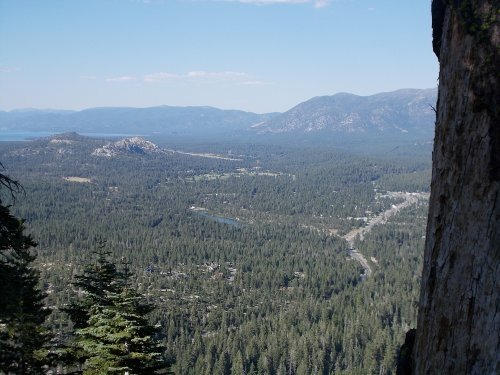 This was the Desolation Wilderness, though. I remembered water being everywhere. 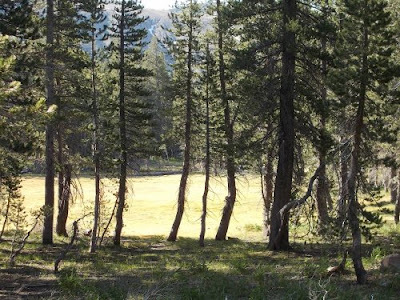 Apparently, that wasn't the case this year, however, as I had to hike several miles into the wilderness before I finally reached water that was actually by the trail: Lake Aloha. I stocked up with water and examined my maps, looking for the next good place well away from water and found.... absolutely nothing. Lake after lake after lake for miles. The best place that would likely be free from mosquitoes would be Dicks Pass which was another seven miles away. I didn't have the energy or the time to hike another seven miles. Crud. I could backtrack, but that would be even worse. 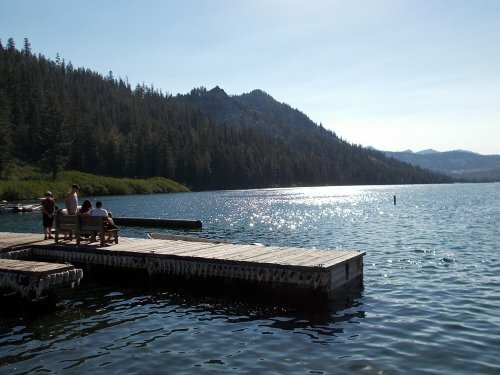 Well, maybe there might be mosquitoes, but you have to give Aloha Lake credit--it's certainly a beautiful place to camp. At least I could admire the wonderful views from camp. Roadkill (foreground) and Coyote (background), PCT thru-hikers. long enough for me to get a good photo! 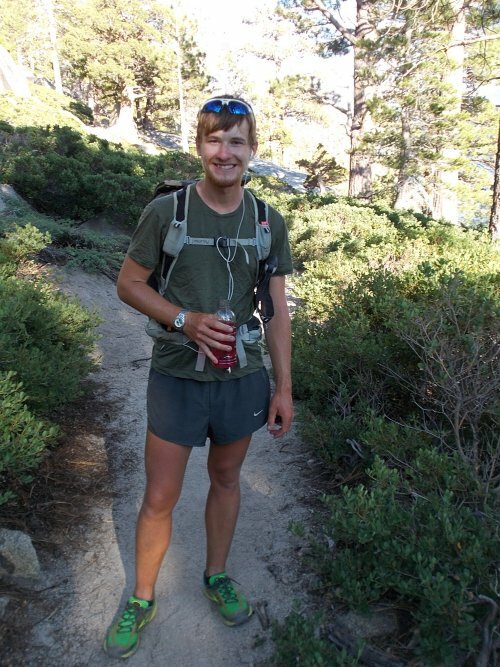 Broken Toe, the guy who plans to set a new PCT speed record next year. I, too, was passed by Broken Toe in 2013. I wondered about his 2014 attempt -- that's how I found you-- and there's nothing on the net. I did meet Scott on his first yoyo and he IS a nice guy.